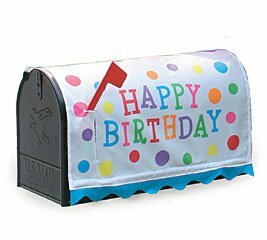 Design: The mailbox cover is white with brightly colored polka dots all around. In the center is a colorful "Happy Birthday" message. There is a blue ruffle design at the bottom. There is a slit for the side flag to slide through.